"SNEGOROCHKA, also known as the 'Snow Maiden' or 'Snowy', is a unique character of Russian folklore and an essential part of Russian New Year's celebrations. The origins of Snegurochka are contradictory. The roots of this feminine character can be found in Slavic pagan beliefs. According to legend, she is the daughter of Father Frost and the Snow Queen. Another Russian fairy-tale, however, tells a story of an old man and woman who had always regretted that they did not have any children. In winter they made a girl out of snow. The snow maiden came alive and became the daughter they never had. They called her 'Snegurochka'. But when the summer sun began to warm the land, the girl became very sad. One day she went into the woods with a group of village girls to pick flowers. It began to get dark and the girls made a fire and began playfully jumping over the flames. Snegurochka also jumped, but suddenly she melted and turned into a white cloud. In some parts of Russia people still follow the ancient tradition of drowning a straw figure in the river or burning it on the bonfire to dispel the winter. This custom symbolizes the transition from winter to spring." "One of the greatest singers to emerge on the international opera scene in the 1950's, Gorr was an artist of intensity and versatility whose penetrating, powerful mezzo-soprano and scalding dramatic temperament made her an incomparable Dalila, a magisterial Amneris and a singularly convincing MÃ¨re Marie in DIALOGUES DES CARMÃ‰LITES, which she sang in the Paris premiere of Poulenc's opera in 1957. Her voice was not to every taste - some found her timbre metallic and her upper range narrow - but few would deny that Rita Gorr had a grandeur and command of the stage unequaled in her generation. Gorr sang with the daring and shrewd sense of her own worth that recalled the divas of a previous golden age: critics reaching for superlatives most often compared Gorr to Marie Delna and Jeanne Gerville-RÃ©ache, two nonpareil French contraltos of the Belle Ã‰poque. She made impressive back-to-back debuts in autumn 1962 at the Metropolitan Opera, as Amneris to Leontyne Price's Aida on 17 October, followed by Dalila in the Lyric Opera of Chicago company premiere of SAMSON ET DALILA on 10 November - an assignment Gorr took over on short notice when Giulietta Simionato proved unwilling to re-learn in French a role she knew only in Italian. Gorr's New York appearances were relatively infrequent, despite the extravagant admiration of the local critics. She sang just forty-one performances of six roles during her five seasons on the Met roster - Amneris, Waltraute, Eboli, Azucena, Santuzza and Dalila, the latter in a new Met production of Saint-SaÃ«ns' opera in 1964, opposite Jess Thomas and Gabriel Bacquier. 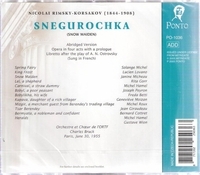 Gorr also appeared in several memorable concert performances of Massenet works at Carnegie Hall, including Anita in LA NAVARRAISE (1963) and Charlotte to Nicolai Gedda's Werther (1965), both presented by the Friends of French Opera, and the title role in HÃ‰RODIADE for the American Opera Society (1964), with RÃ©gine Crespin as Salome. In 1992, she sang Neris in a concert of Cherubini's MEDÃ‰E with Boston Festival Opera. Gorr's last notable U.S. opera house appearance was in 1990, as Madame de Croissy in Seattle Opera's DIALOGUES DES CARMELITES, a characterization she repeated in several subsequent stagings, including Robert Carsen's memorable 1997 production for the Netherlands Opera, and on Kent Nagano's 1990 recording with the OpÃ©ra de Lyon (Virgin). Gorr sang opera for more than fifty years. Her last opera performances were in summer 2007, when she was eighty-one, in THE QUEEN OF SPADES for Vlaamse Opera. She died after a long illness." "Charles Bruck, a Hungarian-French conductor, was born in Timisoara, Hungary (now Romania), in 1911. He became a French citizen and was active in the RÃ©sistance, and was made an officer in the French Legion of Honor. After courses at the Vienna Conservatory and studies in piano and composition (as well as law) in Paris. He left Romania in 1928 for a year of studies in Vienna, then travelled on to Paris. There he studied with Alfred Cortot, Nadia Boulanger and Vlado Perlemuter at the Ã‰cole Normale de Musique. In 1934 he began studies with French conductor Pierre Monteux, following him to San Francisco where Bruck served as Monteux's assistant. He went on to direct the Netherlands Opera, the Strasbourg Radio Symphony Orchestra and the Paris Radio Philharmonic Orchestra, making many guest appearances and recordings and championing many 20th-century composers. After the Second World War, Bruck assumed chief conductor positions with the Orchestra of the Netherlands Opera in Amsterdam (1950-1954), the Orchestre Philharmonique de Strasbourg (1955-1965), and the Orchestre Philharmonique de l'ORTF in Paris (1965-1970). In 1969, he succeeded Monteux as director of his conducting school in Maine, a post he held for twenty-six years until his death there in 1995. Bruck was a champion of contemporary music and presented hundreds of world premieres in his career. He also taught at The Hartt School of Music where he served as Director of Orchestral Activities. He was a visiting professor at Princeton University in 1992. Bruck died in Hancock, Maine, USA. A play about his career as Master of the Pierre Monteux School, called MUSE OF FIRE, written by David Katz, one of his students, was premiered in Maine in 2005 and has since toured extensively."